1) ECDPM, ODI and DIE published the 2013 European Report on Development, entitled ‘Post-2015: Global Action for an Inclusive and Sustainable Future’. 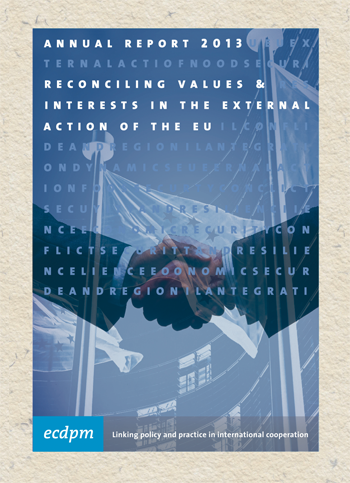 ECDPM was in high demand to present the report to key European, African and global stakeholders and institutions. 2) A post-2015 edition of our GREAT insights magazine featured articles from Betty Maina, a member of the UN High-Level Panel on the Post-2015 Agenda, and Klaus Rudischhauser, EuropeAid Deputy Director General. 3) We published a study on how different EU member states approach the concept of policy coherence for development (PCD). We developed a first methodology to assess the impact of a range of policies of OECD member states on food security in individual partner countries. Both the study and the methodology were recognised as key in advancing policy debate on this topic. 4) We provided the first independent analysis of the EU joint programming process, pointing to critical bottlenecks and remedial measures. We also published an independent assessment of early experiences in programming two principal EU funding instruments: the Development Co-operation Instrument (DCI) and the 11th European Development Fund (EDF). Our review of six ongoing initiatives to increase the effectiveness and relevance of EU development aid and cooperation provided novel insights into budget allocations across funding instruments. 5) ECDPM was an active participant at the 2013 European Development Days. Together with the other members of the European Think-Tanks Group (FRIDE, ODI and DIE) we organised a well received side event that brought together high-level EU officials to discuss the evolving development scene. 6) ECDPM produced a background paper on the future of EU-Pacific relations in preparation for the Eminent Persons Group meeting in Samoa on the future of the ACP Group. We also launched analytical reflections and papers on potential roles to be performed by the ACP Group in a post-2020 context, in cooperation with DIE and independent consultants.